Soccer can be a cruel even in victory. 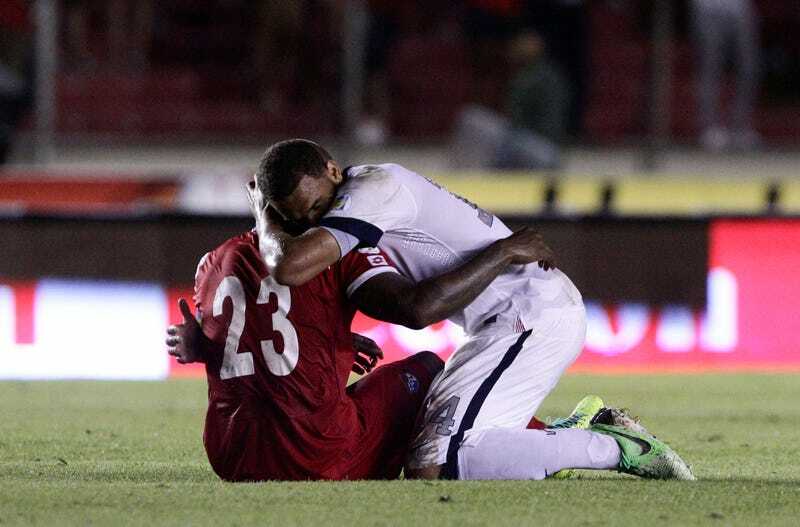 This photo is of the U.S.'s Terrence Boyd tearfully embracing Panama's Felipe Baloy, after two late goals from the USMNT officially eliminated Los Canaleros from the World Cup. But the sport can also be generous in defeat: the U.S.'s win singlehandedly kept alive its fiercest rival, Mexico. Mexico came into the final night of the Hex three points up on Panama, but the tiebreakers meant that if Panama won and El Tri lost, it would be Panama through to a playoff against New Zealand for a trip to Brazil. And through 90 minutes, that's exactly what appeared to be happening. Three minutes of stoppage time was all the time the USMNT needed to shake CONCACAF. At 1:24, Graham Zusi headed home a perfect cross from Brad Davis. Just over a minute later, with Panama desperately pressing forward, Aron Johannsson put the nail in the coffin from just inside the arc. Panama, at home and 100 seconds from keeping the dream alive, was out. It didn't feel good for the Americans. "It shows you how brutal football can be. For one side that's almost there, and then the other side is back in,'' U.S. coach Jurgen Klinsmann said. "Now obviously you feel for the people. You feel for an entire country." It was one of the greatest moments in Mexican sporting history, because the U.S.'s win clinched a playoff for El Tri. Here's how Mexican television announcers reacted, as Mexico's loss to Costa Rica was rendered meaningless: with screams, and scattered English phrases. "We love you! We love you forever and ever! God bless America!" The Americans, having qualified for Brazil, had nothing to play for. Except that's not exactly true. The USMNT isn't some monolithic entity. It's a group of players, all of whom are scrambling for spots on the World Cup roster. Few starters played last night, so it was a showcase for those bubble players. For guys like Davis, Zusi, and Johannsson, this was the biggest match of their careers. And they didn't roll over just to send the Mexicans home. Call it a victory for sportsmanship. Today might be a good day to go out for drinks with any Mexican friends. They definitely owe you a beer.